Home » Jewish Moms » Vote for the JewishMOM.com Chanukah Recipe Contest $100 Winner! 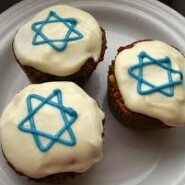 Vote for the JewishMOM.com Chanukah Recipe Contest $100 Winner! Thanks so much to all of you JewishMOMs who submitted recipes. I really enjoyed trying out a few of the submitted recipes over Chanukah, and I also really enjoyed the reminder that it wasn’t just me sweating over my sizzling frying pan all on my lonesome…It made all that frying feel so much for meaningful and fun to know that all of us JewishMOMs were doing it together. The poll will be closing on Thursday at midnight. Good luck to all of our semifinalists! Good luck ladies. For cooking tips and other Jewish recipes do not forget to check out Pinterest. Pages like “Healthy Sukkot Recipes” will provide you with free recipes and cooking tips that you can use to enhance your family’s menu.